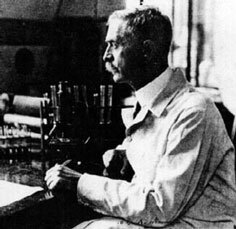 In 1900, Landsteiner observed that the red cells of some individuals were agglutinated by the serum of others and his detailed report a year later heralded the discovery of the first human blood groups. His limited experiments on laboratory colleagues demonstrated three distinct groups; his pupils Von Decastello and Sturli discovered a fourth group in 1902. It was 25 years before these groups were shown to be inherited as Mendelian characters by means of three allelomorphic genes A, B and O and were, in fact, entities of one blood group system. For most of medicine this was considered a meaningless curiosity, but for those involved with the early development of transfusions it was quickly noted that transfusion of blood only of the same group could mean the difference between a successful outcome or a fatality. While various nomenclatures have been used to describe these factors, it was internationally decided in the mid-1940's that the characteristics would be individually identified as A, B, AB and O and the blood group system know as ABO. Since that time there have been billions of tests preformed and almost as many publications describing various aspects and associations of this blood group systems or its allelic products. The genes controlling the ABO system are located on the long arm of chromosome 9 and encode for either an a (1-3) N-acetylgalactosaminyltransferase (for A) or a (1,3) galactosyltransferase (for B). These transferases incorporate immunodominant sugars (GalNAc for A; Gal for B) on to one of four different types of oligosaccharide chains (type 2 is predominant on red cells, type 1 is found in secretions, plasma and some tissue) carried on glycosphingolipid or glycoprotein molecules. The placement of the A and B antigens is dependent upon the existence of a substrate produced by the Hh blood group system (ISBT # 018). Some individuals have weakened or variant expression of A and/or B which can be attributed to inheritance of variant forms of transferases. Those individuals that have neither transferases, inheritors of two amorph genes, are group O. To date, 14 A alleles, 14 B alleles and 8 O alleles have been identified at the molecular level and more remain to be found. The ABO antigens, as stated above are not restricted to the red blood cell membrane but can be found in saliva and all body fluids except spinal fluid if the individual has inherited a secretor gene. The antigens are also found on most epithelial and endothelial cells. It also appears on lymphocytes and platelets as it is adsorbed from the plasma. Alterations of ABH expression have been found in various forms of cancer. Furthermore, antigens of the ABO system may play a role in resistance to bacteria or viruses. There is tremendous population diversity in the percentage of the ABO groups throughout the world. 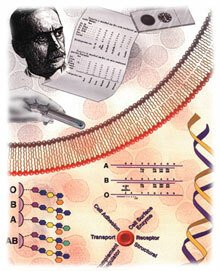 The ease of testing for the ABO blood groups contribute to the broad knowledge base of this blood group system.